markeTING: What Do Consumers Really Want? Marketing and public relations issues and opinions that go beyond the norm. They ting. Once upon a time, the answer to this question was: "What day is it?" Now it is more like the weather in Chicago: "Wait a minute, it'll change." Most consumers want whatever they can get; in a perfect world, they want everything – great product, great price, great service, great delivery, great warranty, plus free stuff just for being a customer. If you are a product manufacturer or a retailer, this order would seem to be tall, but potentially achievable... until you start adding in the extras: Do you have it in another color? Do you have it in a smaller size? Can I get this with an alternate energy source? Is this available in an environmentally friendly version? Can I take it home today and return it a year from now if it shows wear and tear? Consider the electronic book or digital reader. Not so long ago (like today), Kindle was the only real choice for consumers who wanted to read an electronic book. As it turns out, most of the current consumers are business people. It is kind of pricey because there is no real competition and because volume is still relatively low (supply and demand). And you have to buy it through Amazon (not a lot of flexibility here). And just when sales start to pick up, Apple leaks that it will soon have its own hip version of the e-book reader. And then Sony jumps into the ring with equally cool, but cheaper versions. And suddenly consumers have more options - size, price, appearance, functions, availability, brand, etc. - than they ever could have hoped for. And the story is all over the media and all over the Internet. And consumers are blogging and tweeting and texting and getting themselves all in a lather. A tsunami wave of excitement will fuel huge sales, and everyone will soon be sporting e-book fanny packs and shoulder slings. But back to reality. There currently is only one option available (Kindle) and most consumers have no idea what a Kindle or an e-book reader is. And once they find out, most - especially in this economic environment - will deem it to be unaffordable (at least until it becomes cool and a status symbol). In short, even though they don't know it yet, consumers will soon want an e-book or digital reader and everything that goes with it. That's the way we roll in America. 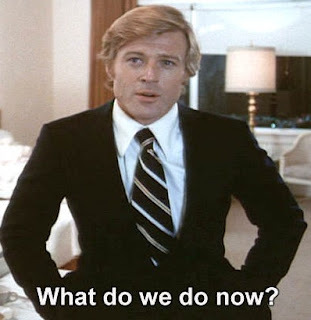 Which reminds me of the last line in the final scene of The Candidate, when Bill McKay (Robert Redford) realizes that he just won the election that he isn't sure he really wants: "What do we do now?" How Exactly Is This a PR Crisis? When You Think Retail, Think John F. Geisse. What Happens When Everyone Becomes a Shill? Don't Guess. Test before You Invest.